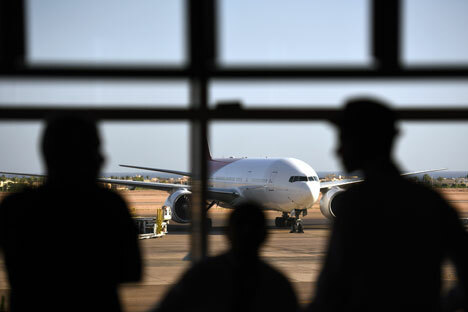 Tourists look out at a Russian plane on the tarmac of the airport in Egypt's Red Sea resort of Sharm el-Sheikh on November 6, 2015. Egyptian Foreign Minister Sameh Shoukry hopes for the soonest resumption of air travel with Russia and Russian tourist arrivals in Egyptian resort towns. "I hope that it will soon be possible to resume direct air travel between our countries and to restore the scope of tourist arrivals [from Russia] in Egypt," Shoukry said after negotiations with Russian Foreign Minister Sergei Lavrov. Four million Egyptians depend on the travel industry, he said. "So, we have taken steps to develop technical cooperation with Russia in the provision of airport security. We have been visited by a number of Russian technical delegations and have received new systems which will guarantee airport security," the Egyptian minister said. "On the whole, the level of cooperation is satisfactory for both sides," Shoukry said. "We will continue to cooperate on a transparent and efficient basis to restore tourist arrivals from Russia. We will be closely interacting with Minister Lavrov in this area," the Egyptian foreign minister said. Russian President Vladimir Putin on Nov. 8 issued a decree, On Some Measures to Ensure the National Security of the Russian Federation and Protection of Citizens of the Russian Federation from Criminal and Other Illegal Actions, which suspends flights to Egypt. The decree recommends that tour operators and tour agents refrain from selling to citizens tour packages envisaging flights from Russia to Egypt in the course of the time the ban remains in place. A Russian Kogalymavia Airbus A321 passenger plane, en route from Egypt's Red Sea resort of Sharm el-Sheikh to St. Petersburg, crashed 23 minutes after takeoff in the Sinai Peninsula on October 31, killing all 217 passengers and seven crewmembers. Russian FSB head Bortnikov said on Nov. 17, that an explosive device had blown up on board the A321. The incident is being investigated as a terrorist attack.